Want Outdoor Battery Lights that Last but dont cost the earth? A Simple Practical and Safe Alternative to Mains, Our Low Voltage Outdoor Battery Powered Fairy Lights, Can be Used Practically Anywhere in the Garden, Trees, Bushes, Fences Pergolas. Creating an outdoor atmosphere that will deliver eye-catching sensory emotions of pure awe and a feeling of warmth, the use of outdoor battery fairy lights can do just that. They will provide the twinkling soft glow during a warm moonlit summer evening while lounging on your patio. You can use them to create a perfect setting for any wedding ceremony or reception that will give guests an atmosphere of mystic and wonder as they bask in the sparkling warm luminosity that will surround them in bliss. The uses for these outdoor batter fairy lights are limitless and with their more eco-friendly and safe capabilities, they are a perfect choice either indoors or out. They could even be used to light up your home during Christmas time with different shapes and sizes available to suit just about every holiday or event. The outdoor battery fairy lights are waterproof and are very friendly to the environment because they do not use electricity to power them. The easy removable batteries are cheaper to the consumer than replacing the wiring or buying new strands because of shorts and breakage. The non-electricity need lets you be able to use them safely around water, drier Christmas tree types, on certain fabrics and is safer for children with no fear of electrocution or fire. The cost savings measures that battery powered products give back is seen on your electric bills and during times of high uses of electricity such as Christmas and the New Year or even some high-class wedding venues, the savings will astound you. The outdoor battery fairy lights not requiring electrical power lets you hang them just about anywhere with ease. They come with clips, and the strands are long to give you the ease of use from the back garden, patio, around the pool, over your camper awning or even a destination wedding on a warm sandy beach in Hawaii. 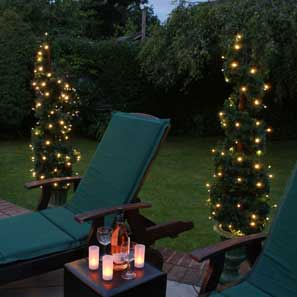 Outdoor battery fairy lights allow you to move them around with ease, and you can access different areas of your yard and home with no need to worry about having a plug handy to power them. Whether you want to class up your garden space or create an elaborate sensory experience in your porch or sun room, these battery powered led lights will give you what you desire. The ease of use and energy efficiency will amaze, and you can create the warm twinkling glow anywhere, from ocean side to Christmas tree, and leave everyone at your events or parties a lasting memory of sparkling bliss and warm luminosity. You can also safely use them near water and dry, parched fabric or in your kids playhouse without fear of fire or electric shocks.